The Enerdrive ePOWER DC2DC Battery Charger is a fully automatic multistage, multi input battery charger with the ability to charge from either an alternator linked to a battery; or via solar power with the in built Maximum Power Point Tracking (MPPT) Solar Controller. Enerdrive ePOWER 24V – 30A DC2DC Battery Charger. The Enerdrive ePOWER DC2DC Battery Charger is a fully automatic multistage, multi input battery charger with the ability to charge from either an alternator linked to a battery; or via solar power with the in built Maximum Power Point Tracking (MPPT) Solar Controller. With two inputs available, the house battery will be charged from either the engine while underway, or via the solar panels when stationary. The process to choose either engine or solar is fully automatic and both functions are controlled from within the unit itself without the need for external relays. During normal operation the ePOWER DC2DC Battery Charger will do a full charge cycle to float stage on the house battery bank with ability to choose either GEL, AGM, Flooded, Custom Programmable or Lithium. Once float stage is reached the charger transitions to a power supply mode to support any on-board DC loads. The ePOWER DC2DC Battery Charger is a fully automatic, set and forget charger. It is designed to quickly and accurately recharge your deep cycle batteries utilising charger algorithms that help to maximise the life of your specialised deep cycle batteries. The ePOWER DC2DC Battery Charger features multistage smart charging technology that enables the charger to be connected to your battery banks permanently. With the input of multiple sources, you can be assured of charging your batteries whenever underway; or when the sun is shining on your solar array. 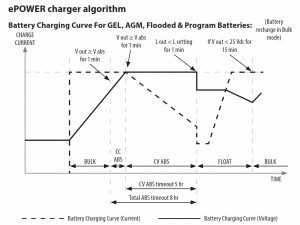 As dictated by battery manufacturer’s recommendations, deep cycle batteries require a multistage charge sequence for perfect, fast and accurate charging. 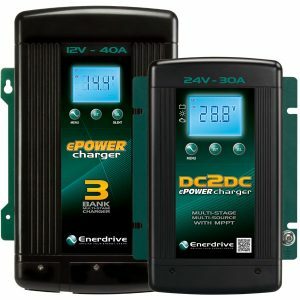 The Enerdrive ePOWER DC2DC smart charger delivers three primary charge stages. The ePOWER DC2DC Battery Charger will regulate its output based on the loads connected to your battery banks. This function is important to maintain the life of your battery banks as some battery chargers mistake loads for discharge and continue to keep the batteries in the bulk or absorption stage for extended periods of time, which will damage the battery bank. The ePOWER DC2DC Battery Charger has two methods of load based regulation to ensure your battery charger transitions to float when it should do so. Lithium 27.8V-29.2V (0.2V Step) (see Note2) 27V-28.4V (0.2V Step) N.A. Program (Custom) 27.6V-29.6 (0.2V Step) 26.0V-27.6 (0.2V Step) N.A. * For Concorde™ branded batteries (lifeline, sun xtender) use flooded setting and consult battery supplier for equalisation recommendations. Note 1: Equalisation setting can only be used on flooded battery type selection only. See more details on Procedure to Equalise the Flooded Battery. Note 2: Charger will terminate charging when charging current drops to below the set charger termination value. Note 3: Charger is acting as a power supply with selected constant output voltage and preset maximum output current. NOTE: The equalisation function although included in the ePOWER DC2DC will rarely be used. To activate the battery bank must be in float, and manually activated. A typical drive will not be long enough for the DC2DC function to complete the process. The MPPT Solar function may provide enough time for Equalisation, but the best recommendation will be an AC powered battery charger. The battery charging current rating is based on the battery size. The battery bank should meet the minimum Ah rating as shown. If a smaller size battery bank is used, set the current rating to a lower value to match with the battery bank size. Normally, the minimum battery bank capacity is based on a C5 rating of the battery for charging. Note: Use the above table to set the Bulk and its related Absorption (ABS) to Float Charge Current. IMPORTANT NOTE: If in doubt of the “L” Setting, use the highest available current setting for battery protection.